Dazzling use of language on display in Sarah Ruhl’s adaptation of the letters of the great 20th century poets Elizabeth Bishop and Robert Lowell. The great mid-20th century American poets Elizabeth Bishop and Robert Lowell were friends from 1947 until his sudden death 30 years later. As they were usually in different cities and countries (Bishop lived in Brazil for many years while Lowell lived in New York City and Boston), they wrote each other over 450 letters which were published in 2008 as Words in Air: The Complete Correspondence between Elizabeth Bishop and Robert Lowell. Sarah Ruhl, an adventurous playwright whose plays tend to be very different from each other, has adapted the letters for the stage in a homage to writing and friendship called Dear Elizabeth in which all of the words are that of the poets. Kate Whorskey’s fascinating production for WP Theater (formerly The Women’s Project) has staged the play much in the manner of last year’s revival of A.R. Gurney’s Love Letters and also with revolving casts. The letters begin in 1947 soon after the poets have been introduced by Randall Jarrell. Bishop writes to “Mr. Lowell” to congratulate him on winning the Pulitzer Prize. Soon she is being asked to call him “Cal,” his long time nickname. Bishop writes of her travels, her move to Brazil to be with her lover Lota (architect Lota de Macedo Soares), her return to America to teach, and the death of Lota. Lowell writes of his divorce from short story writer Jean Stafford, his marriage to essayist Elizabeth Hardwick and the birth of his daughter Harriet, his affair with Anglo-Irish novelist Lady Caroline Blackwood and subsequent marriage to her. They speak of their travels and their homes: New York, Yaddo (the writer’s colony), Massachusetts, Italy, London for Lowell, New York, Maine, Washington, D.C., Key West , Brazil, Boston for Bishop. They write of their demons: her asthma and alcoholism, his manic depression which leads to many hospitalizations. They also write about poetry and the problems of writing, and of writers they are in touch with (Dylan Thomas, William Carlos Williams, Anais Nin, Ezra Pound, Peter Taylor, Flannery O’Connor, Marianne Moore, Stanley Kunitz). They offer each other advice on the work they are doing. Their letters are wise and witty, both revealing of their characters and enlightening on the ways of the heart. They recite their most famous poems in various ways: she records “The Fish,” and later reads “The Armadillo” which Lowell carried around in his pocket the rest of his life, and he dedicates “Skunk Hour” to her and they take turns reading it aloud. He finishes a poem, “Water,” which recalls their meeting one weekend in Maine, and she reads her “One Art” which sums up her philosophy: “The art of losing isn’t hard to master.” The most dramatic moment is when Bishop writes to Lowell to tell him not to publish The Dolphin in which he has not only used his ex-wife Elizabeth Hardwick’s letters but also altered them to suit his purposes: “Lizzie is not dead – but here is a mixture of fact & fiction, and you have changed her letters. That is ‘infinite mischief,’ I think.” Ironically, the book went on to win Lowell his second Pulitzer Prize for Poetry. Whoriskey has staged the play with both actors at desks from which they not so much read the letters as say them as though composing them at that moment or talking to the other on the phone. Stage manager Polly Noonan (in all six casts) sits at a desk on stage left and sets the scene for each section of the play. When Bishop and Lowell meet so that there are gaps in the letters, they get up and encounter each other in “Interludes” which are narrated by Noonan. 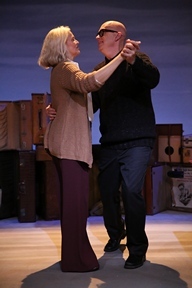 The stage is backed by a cyclorama used for effective mood lighting by Mary Louise Geiger and a set by Antje Ellermann of many suitcases and trunks, some open to pictures and objects that relate to the poets. The cast under review is made up of Ellen McLaughlin and Rinde Eckert. Both make you feel that they are not so much acting, but that you have met Bishop and Lowell in the flesh. Both are wry and ironic in their delivery, while she seems fragile and uncertain and he appears patrician and self-confident. While he was famous as part of the confessional school of poetry, it is she who seems to be revealing the most of her inner life. Not for an instant does attention flag and you hang on their every word wanting to know how things turn out and what event or disaster will engulf them next. This is a platonic love affair but one from which both characters take much sustenance. Both Bishop and Lowell told others that each was the other’s best friend. McLaughlin and Eckert make that clear from the very beginning. Honesty and self-reflection lead one woman on a journey to find her true strength and the beauty that exists in her past, present and future. 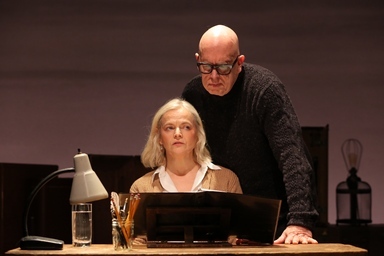 From its coy and inherently contradictory title to its unfolding, at first in real time, this play by Sarah Ruhl takes us on a thoughtful journey to the spiritually unknown. A searing documentary solo play about the Michael Brown shooting in which writer Dael Orlandersmith vividly performs as a cross section of Missouri residents. Playwright Theresa Rebeck takes us on a trip back to the early 1990’s, a time which looks sadly familiar. As performed by The Bats, Ellen McLaughlin’s new contemporary adaptation of Euripides’ “The Trojan Women” is a powerful anti-war statement.